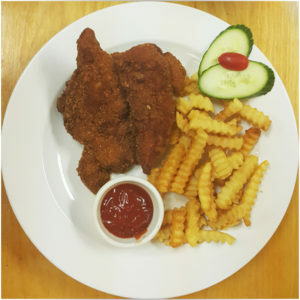 Succulent juicy chicken tenders fried to crispy golden perfection. Served with fries, and your choice of Ghetto Sauce, BBQ Sauce, Honey mustard sauce, or Ranch. Ghetto sauce, is spicy, zingy and moreish. BBQ Sauce, is smokey bold, and sweet. Honey Mustard Sauce, is sweet, not to strong and bold. Golden fried tender chicken, crispy fries, mouth watering sauce.